Everything you need to play on your new table. The Brunswick Centennial Play Package is the perfect package to get with your new pool table. Included in this package: Centennial Aramith Phenolic Resin Pool Balls, 4 Centennial Cues, Two-Piece Short Cue, Two-Piece Bridge Stick, Brass Bridge Head, Big Break Rack, Nine-Ball Rack, Table Brush, 12 Pieces of Chalk, Offical BCA Rule Book and the Brunswick Getting Started DVD featuring Ewa Mataya Laurance. Makes a great gift. The Brunswick Heritage Play Package makes a great addition to your pool table purchase, providing almost everything you need to play the game: Heritage Aramith Phenolic Resin Pool Balls, 4 Heritage Cues, Two-Piece Short Cue, Two-Piece Bridge Stick, Brass Bridge Head, Big Break Rack, Table Brush, 12 Pieces of Chalk and an Official BCA Rule Book. Brunswick’s Heritage package also makes a great gift. The Skillful Gold Play Package has everything you need to accessorize your new pool table. 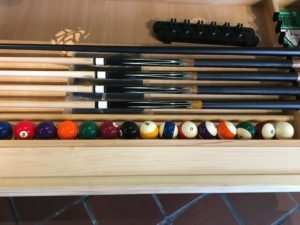 Package includes: Aramith Crown Standard Pool Balls, 8-Ball Triangle Rack, 9-Ball Diamond Rack, Table Brush, Plastic Table Cover, 6 Cue Wall Rack, 4 Players Cues, Rule Book, Two-Piece Bridge Stick, Bronze Bridge Head, and 12 Pieces of Chalk. The Skillful Gold Play Package also makes a great gift.